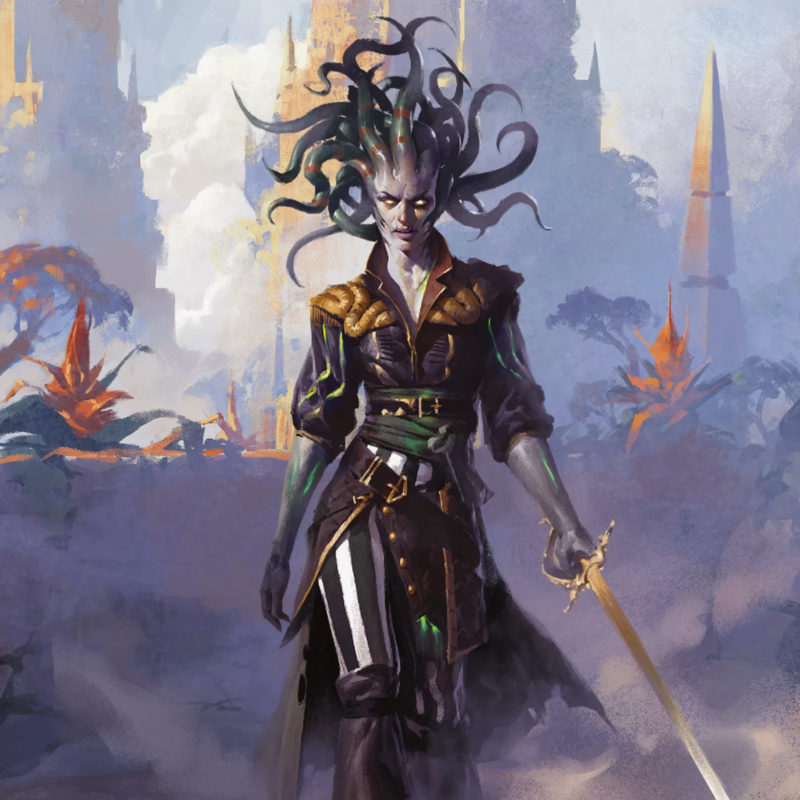 “Vraska, Scheming Gorgon” by Grzegorz Rutkowski / Wizards of the Coast. With Iconic Masters just barely behind us and Unstable only days away, Wizards continues its early tease of Rivals of Ixalan. This time around, the spoilers come via Polygon.com, who spoke with Magic: the Gathering senior game designer James Wyatt and senior art director Cynthia Sheppard about creating the plane of Ixalan. Unlike the previously spoiled Ixalan Store Championship promos, the Polygon cards will all appear in the Rivals of Ixalan Planeswalker decks—intentionally underpowered cards sold exclusively as part of preconstructed decks. These cards may not excite established or competitive players, but they do serve to help show off the art and style of the set. 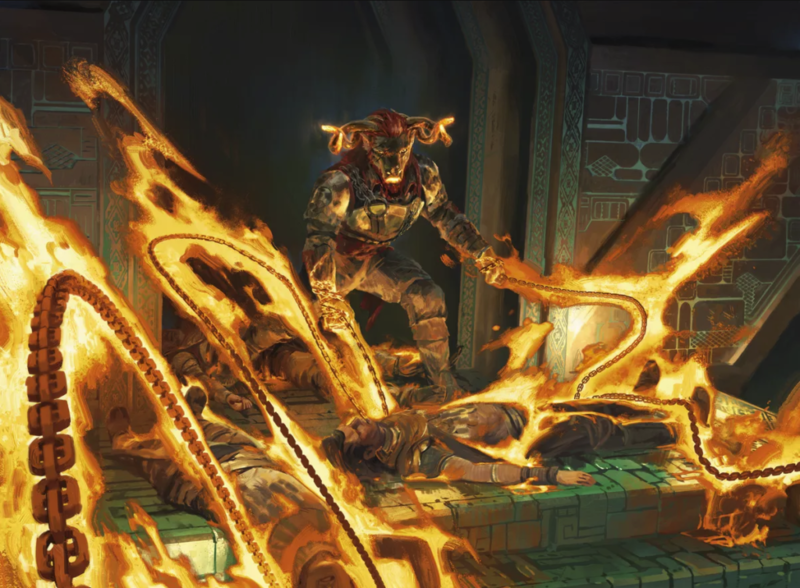 These spoilers also provide a better look at Angrath, the minotaur planeswalker previously only depicted in the Ixalan printing of Hijack. Little is currently known about Angrath, other than that he is trapped by Ixalan’s Binding. The mystery behind this planeswalker has lead some to speculate that he may be the tie between Rivals of Ixalan and 2018’s upcoming return to Dominaria. 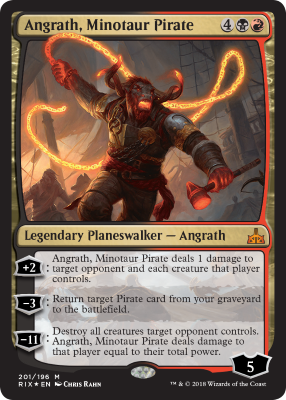 Based on previous Planeswalker decks, the inclusion of Angrath, Minotaur Pirate implies a separate card will most likely appear in the full Rivals of Ixalan set proper as well. 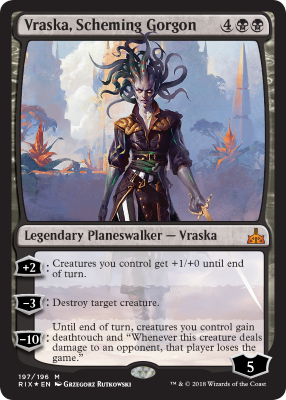 For the full set of spoilers, higher resolution images and a deeper look at Rivals of Ixalan (including more gorgeous art like Grzegorz Rutkowski’s rendition of Vraska, Scheming Gorgon above), visit Polygon.com. Rivals of Ixalan releases January 19, 2018. “Angrath’s Fury” by Lake Hurwitz / Wizards of the Coast. +2: Angrath, Minotaur Pirate deals 1 damage to target opponent and each creature that player controls.